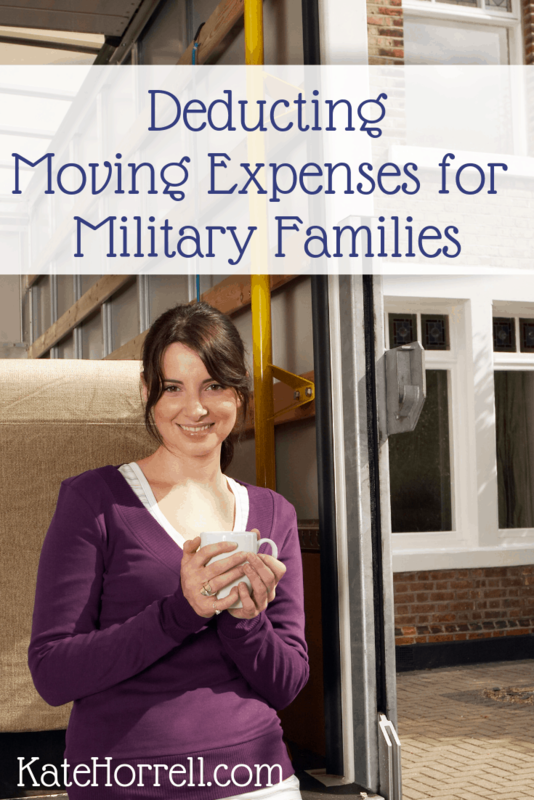 What Military Moving Expenses are Tax-Deductible? PCS moves are expensive. Even with all the allowances, you’ll sometimes have some out-of-pocket expenses, especially if you have pets. Thankfully, unreimbursed moving expenses can be deducted from your income taxes, and they’re a most valuable type of deduction. Disclaimer: I am not a tax professional. Do not make any decisions based solely on the information I am sharing here. Read the IRS rules yourself, and talk to your tax preparer. However, if your tax preparer is telling you to deduct things that don’t jive with the IRS rules, you might want to look into that situation. Are You Eligible To Deduct Moving Expenses? Under the current tax law, most people aren’t eligible to deduct moving expenses. Military members, however, still get to deduct these expenses. They do not have to meet the time or distance test if moving on Permanent Change of Station (PCS) orders. Military moves should still be within 1 year of the start of work in order to meet the “move closely related to the start of work” test. Deductible moving expenses are calculated using IRS Form 3903. It’s a remarkably simple form, but the instructions aren’t as clear as they could be. Once you’ve calculated the amount you can deduct, it goes on Line 26 of Schedule 1 of the 1040 Income Tax Return. This “above-the-line” deduction is more valuable than a regular deduction because it doesn’t require that you itemize deduction in order to benefit. It also lowers your Adjusted Gross Income (AGI), which affects eligibility for other credits and deductions. Some things that seem like they should be deductible are not actually deductible. You can not deduct meals while travelling from your old home to your new home. The temporary lodging deduction is limited to one day after you move out of your old house, the days of travel, and one day after you arrive at your new home. Military members must be sure to properly account for allowances received for the expenses they are deducting. For example, if you received a $550 allowance towards the quarantine of a pet during a move, and you actually paid $750 for pet quarantine expenses, you would report both the total expense and the reimbursement amount on the Form 3903, resulting in a $200 deducting for pet quarantine expenses. While actual facts are scarce, the IRS seems to have changed their opinion on Dislocation Allowance (DLA) – while you used to exclude it from your reimbursements, it is now included when calculating your out-of-pocket expenses. The moving expense deduction can help defray some of the out-of-pocket costs in a move, but it is very important to follow the rules carefully. You can’t deduct everything you spend during a move, and you can’t deduct things for which you’ve received a reimbursement. The reason some people (well one reason) don’t think DLA “counts” is the way the directions in pub 521 are written. They just read step 2 or don’t really understand what step 1 is saying and probably don’t read the whole section. Or they don’t read pub 521 at all. I am so lost. Form 3903 line 4 says the amount the military gave us for moving should be listed in box 12 with code P. We PCS’d in 2018 and I am pretty sure we got some kind of money for moving but there is no code P in box 12. Do you have any ideas what’s going on here? Are you looking at your regular W-2, or your travel W-2 (if you have one)? They’re separate documents; you can get them both from DFAS. A travel W-2 isn’t listed in myPay. Is going to finance the only way to get a copy? Did you do a Personally Procured Move (formerly known as a DITY move)? Or are you just talking about the regular reimbursements for a PCS move? We PCS’d from FL to Guam (OCONUS) in 2015, car went into storage. PCS’d to San Diego in 2018. Drove car from FL to CA, unreimbursed. Is the distance and lodging deductible for moving the car? Thanks! Also paid out of pocket for transporting our dog from Guam to SD. Is the shipping cost deductible (there was no quarantine or kennel charge)? we pcs’d from VA to TX, I moved our boat and gun/ammo by car. The Air Force did not pay to move those items. What can I deduct, if any??? You got mileage for that travel, right? I’m thinking the IRS would consider that reimbursement.